How much would the EU budget reduce by after Brexit? 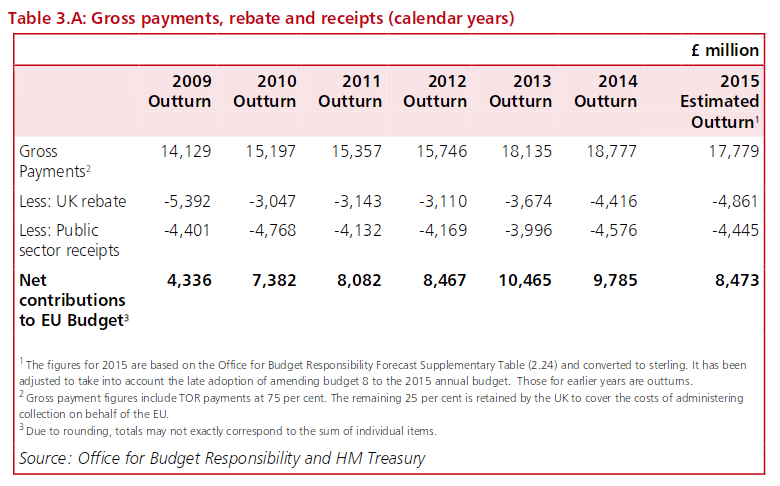 Would it reduce the budget of some €133bn by the gross amount after the rebate but before any spending from the EU into the UK (€17bn, about 12.5% according to Table 6, Page 11 of the 2017 draft budget) or by the net amount, which is some lower figure, (perhaps 6% ?) of the budget? Assuming no changes due to other countries contributing more, etc. as a result of the UK leaving. It's purely about discerning what proportion of the budget is contributed by the UK's contribution, not what the actual change to the budget will be. Naturally, the net contribution is what matters for analysis the case of "EU budget without UK". However, as both report point out, the UK receives other contribution, which come from an "allocation of funds via competition". Think of the EU having a fund for, say, improvement in infrastructure. Countries apply to this fund, and some countries get it. Well, as the first report says, the UK got £1bn extra through that mechanism in the 2015/16 year. Should this be counted as part of the exercise? Probably not, because those extra funds would have been allocated to another country anyway. Regarding 2017, table in page 11 shows only the gross payments, including the rebate, but not the public rector receipts. As such, the effective contribution of the UK is not going to be 12.5% as the document notes, but lower. Given historical levels of receipts, you could estimate that the contribution of the UK to the EU budget would be perhaps around 9%. In any case, as far as I know, this cannot be known ex-ante, reason why it is not included in the official budget document. Budget are negotiated annually among all members, and contributions vary accordingly. As such, if countries expect less revenues, they might either lower expenditures, or increase demand for contributions to other countries. For instance, immediately after the Brexit vote, speculation arose that Germany would cover any hole left by the UK. An important component of budget (31% in 2014) does not come from individual countries contributions. As such, how these evolve affects particularly how much countries contribute. Brexit might induce an adjustment on the so-called correction mechanisms. Countries contribution vary over time depending on many national circumstances, including the size of their economy, which then depends on economic growth, uneven across the EU. The UK is expected to pay the EU before it leaves, known as a "divorce" or "exit" bill, which depends on the outcome of negotiations. It depends on what deal the UK and EU have after Brexit. A Norway style of deal means the UK would have to pay to the EU. In conclusion, it is simply impossible to tell. The calculations you make are a simple ceteris paribus exercise of removing the UK from the _current EU budget. That might be illustrative, but given the huge uncertainty on the issue, it's probably a rather brute calculation. Not the answer you're looking for? Browse other questions tagged eu or ask your own question.